Liz's Paper Loft: MCT October Release Blog Hop ~ ho ho ho! Good morning and welcome to My Creative Time October Release Blog Hop! You should have arrived here from the fabulous Miss Kim! If you just popped in to see me, then please head over to the start, the wonderful Miss Emma! 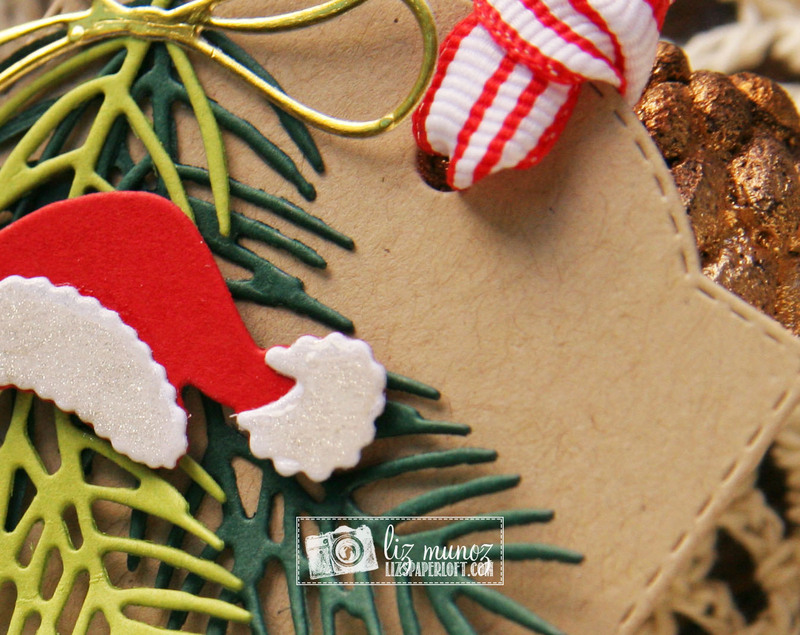 A beautiful bough and a santa hat make for a cute tag! Quick, Easy, and ready to go for Christmas! ***SALE ALERT*** ALSO, DON'T FORGET our sale starts RIGHT NOW here:http://shop.my-creative-time.com/Ne...! Use the code: OCT2016 to receive a discount off your entire purchase! This sale applies to "IN-STOCK" items ONLY. This sale will end on Fri, October 28th, 2016 @midnight PST. What a darling tag! 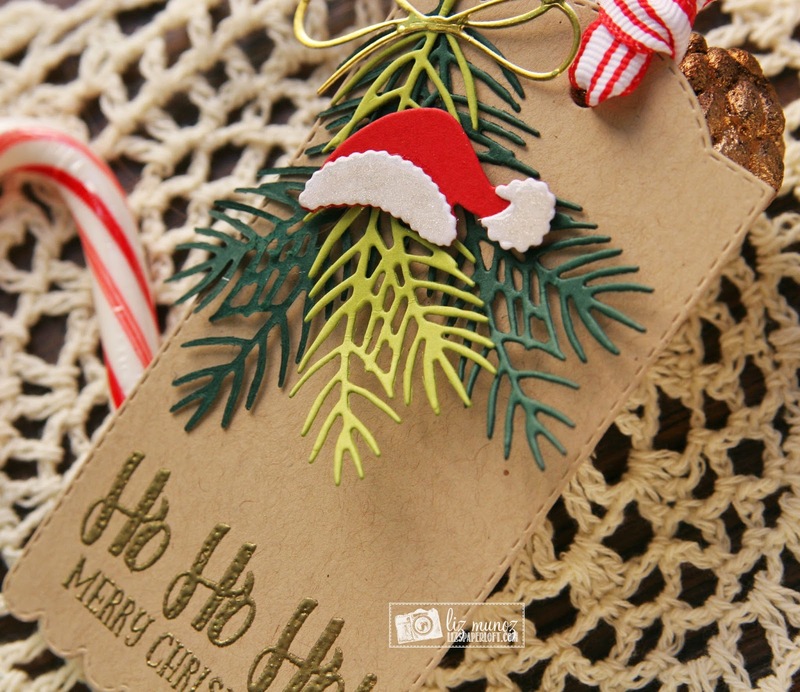 The branches look amazing on the kraft colored tag! I love the sweet little Santa hat! The embossing looks amazing~such a great creation! I hope to knock out a lot of tags this year for my gifts. I always run short on time for that but with this set, I'm hoping I can get it done, lol! Wonderful creations all week Liz!!! Ms. Liz, how cute is this tag! Can't wait to make some and thanks for all of your inspiration. oh my my my....I LOVE you tag my friend!!!! GREAT JOB on all of your sneaky peeks this entire week!!! Very cute idea for a tag! What a cute idea! Love that bough die and using the Santa hat on top is just too cute! I really like your tag. The branches are set off by just adding the santa hat! Liz, yes, your tag is cute, but it's also incredibly classy! What a sweet way to showcase the new release! My festive spirit is a-flame! 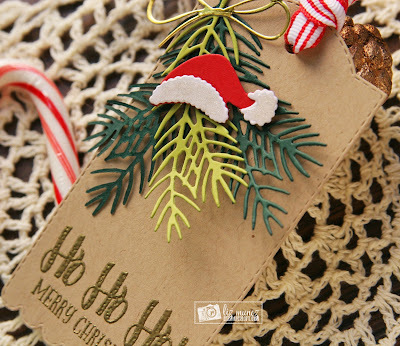 Super cute tag with the fir branches and Santa hat! Thanks for sharing your creativity! Love your Tag, I can certainly use a lot of these for the coming holidays. I better get started. Plain and simple but so cute. Quick, easy, and classy! It's pretty with a bit of whimsy. Great idea! Your tag is so beautiful. Thanks for all your great ideas this week. I've really enjoyed them all. What a great tag! I love the greenery! Love your fantastic tag. Kraft looks great. Adorable tag and I love your branches being different shades of green! Looks amazing! The little Santa's hat looks adorable there too! Love this new release and all of the new stamps and dies! Can't wait to get my happy mail, so that I can play too! I love tags. Wonderful idea, so very cute. It's been too long (I've been going through a little rough patch and have missed so many wonderful creations...and your sunny disposition! Hope you've been well! :))! I love your pretty tag and another amazing release!!! Adorable tag! Love the cute Santa hat and the pine boughs! Great sentiment to finish it also! Darling tag, Liz! I can see how it would be quick to make, but it definitely packs a punch!!! Your tag is so pretty, lovin the pine leaves, just the perfect touch! Such a beautiful tag! 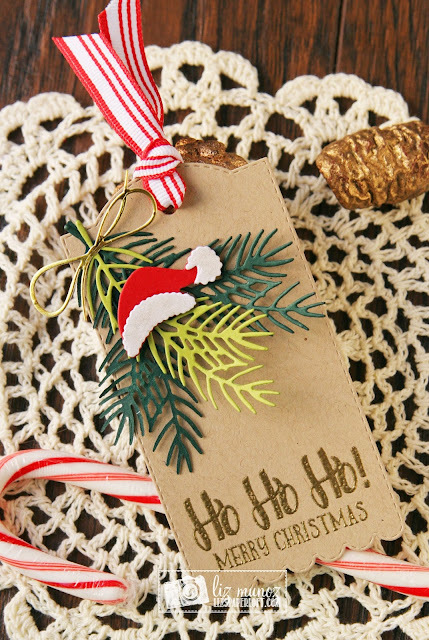 !I absolutely adore the Santa suit die and lovely sentiment too!! Your simple tag is fabulous! The pine and hat do make a cute tag! Darling tag! Love the greenery/pine branches! So simple yet so pretty! Love your tag! A nice quick and easy project !